There would be more flights to Kuching when there’s a festive season. The announcement was made by the Transport Minister Anthony Loke Siew Fook. According to Anthony, the number of flights flying to Kuching, and other popular destinations during festive season would be increased by 20 per cent. This technically means there would be two more additional flights added to every 10 existing flights flying to Kuching during festive seasons. Air fares to Kuching is at its peak during festive seasons. 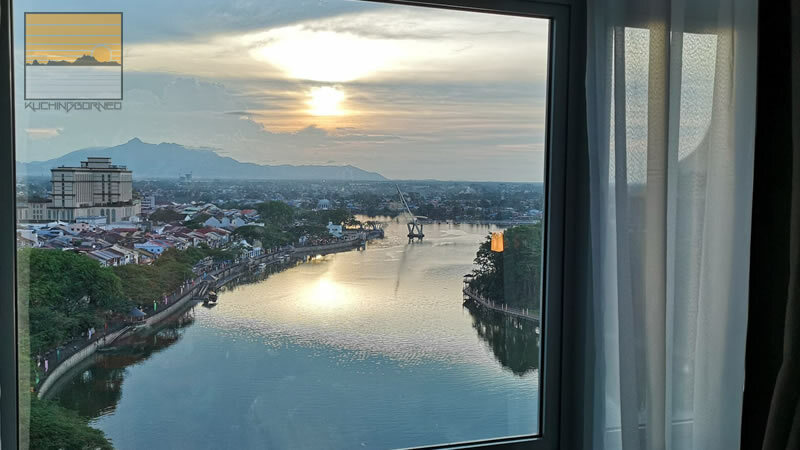 View of Kuching from the The Astana Wing Hotel. 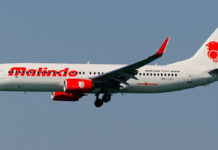 A report by New Straits Times said that Malaysia’s three major airlines namely Malaysia Airlines, AirAsia and Malindo had agreed to increase of domestic flight capacity as requested. Anthony hoped that the increase in flights would translate to lower prices, hence keeping air fares affordable. The additional flights would be made available for seven consecutive days before an identified festive season. Plan have now been made up to put the mechanism on a trial stage starting next year during the Chinese New Year, Hari Raya Aidilfitri, as well as Pesta Kaamatan and Hari Gawai. There was no announcement of routes selected for the Hari Gawai and Pesta Kaamatan but I believe it will involve Kuching, Kota Kinabalu, Johor Bharu, Sibu and Miri. 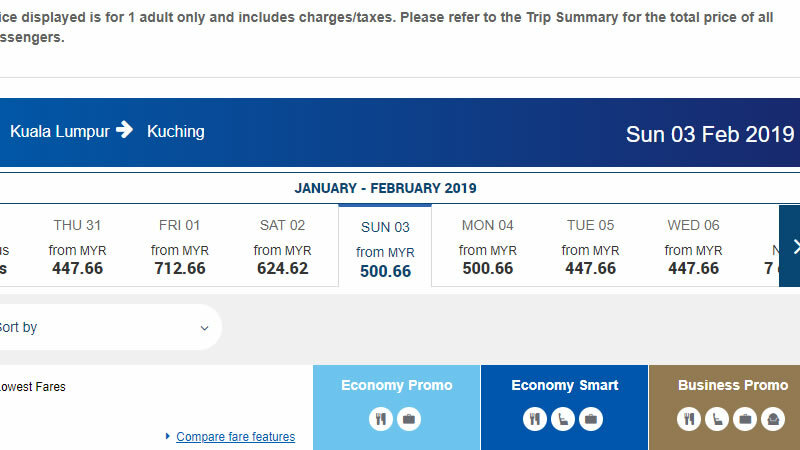 Malaysia Airlines flight price from KL to Kuching (One Way) before Chinese New Year on 3rd October 2018. Tickets during the trial stage are already available online for purchase. I checked the flights and found out that the cheapest one way flight for Chinese New Year would cost you at least RM374 (AirAsia excluding luggage and meals) on Saturday, 2nd February 2018. Chinese New Year falls on Tuesday 5th February 2019. However, if you are just looking to get just cheap flights to Kuching (or outside), I do recommend searching for a flight using JetRadar. The site compares airlines prices for your convenience. Not only give more flights.. i hope the airliners use wide-body aircraft (i.e A330 or A350 or or or A380) for the daily flight esp. to/from KCH, MYY, BTU, SBW, BKI instead of using narrow-body aircraft. If there are more flights, the price of the ticket must be cheap too. Sensible approach by MAS, AA & Malindo. More volume while keeping ticket price attractive. But KIA airport must be sufficiently staffed to cater for increase in air traffic. Some time ago there news saying AA gonna fly the KCH~ BKK and KCH~JKT routes.? What happened to that.? Should be next year as far as I know. True. Better than having a ceiling price. Probably they should introduce more wide body aircrafts during peak hours. 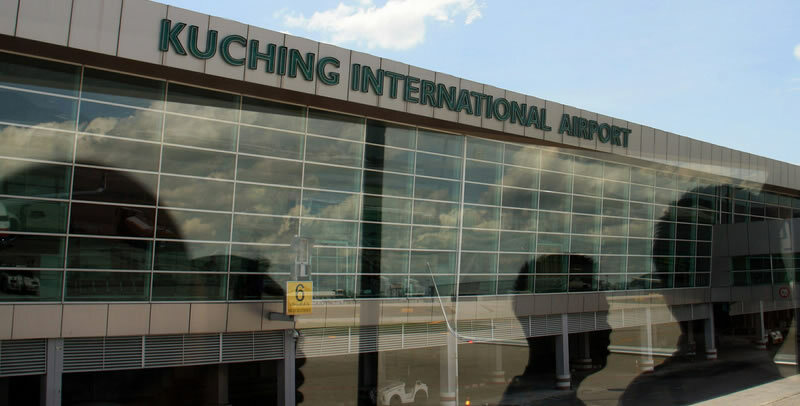 DIRECT INTERNATIONAL AIR FLIGHTS IT’S WHAT KUCHING NEED ! WHEN IT’S KUCHING LCCT GOING TO BE BUILT ?? ?